When packing for a family vacation, you’ve got the standard stuff down. Clothes, shoes, toiletries…check, check, check! But what about those odd little things that will make your trip oh-so-much easier and more enjoyable? Your family vacation packing list is about to get a whole lot handier, thanks to these suggestions for unusual things to pack from family travel experts. A Sharpie is a must-pack item for any family vacation packing list. My family brings along a Sharpie so we can mark the lids of bottled beverages like water or soda with each family member’s first initial. We’ve also been known to mark tubes of toothpaste and medicine cups to identify the correct owner. The one thing we want to be sure not to share while traveling is germs! We mark leftovers, too, so we know who can claim the half-eaten cupcake before a sibling war breaks out. You can also use a Sharpie to label beach toys, camping gear and more. Of course, you can use Sharpies for crafts on the go, too! The one thing my family always packs is a roll of blue painters tape. We use it (with a sharpie) to mark water bottles. It’s great for taping sunscreen and toiletries closed, and also things we purchase (like honey). If we want to wrap up fragile purchases, we may need to purchase bubble wrap, but we already have the tape! And the kids use it all the time for crafts and even in-room fort construction. My family never travels without a headlamp. Headlamps are great for under the sheets story time with older kids when you also have a little one that goes to bed early. They are also helpful if you have an early flight and want to pack without turning on the light while the kids are still sleeping. We also throw a headlamp into our day pack if we go hiking, just in case sunset happens quicker than we thought. We even bring a headlamp to the beach. It’s a lifesaver for when you are watching a gorgeous sunset and then you need to pack up your kids toys in the dark. We always pack Post-It Notes when we travel. They work great for the kids to draw on with just a pen or Sharpie or whatever is handy. My oldest loves to make “cards” and then have a battle like Pokemon cards. My youngest practices letters and draws pictures and tries to keep up with his big brother. Another benefit of Post-It Notes is when you are potty training or have a child who is terrified of flushing toilets, putting one over the sensor will prevent them from flushing. Don’t forget to pack duct tape. Duct tape does it all…fixes broken shoes, repairs ripped clothes, creates an emergency bandage, and saves torn backpacks/luggage/mosquito nets. Use duct tap to help baby proof hotel rooms, remove lint from clothes, and seal toiletry bottles. The colorful type of duct tape can even be used for crafts during airplane and car rides. To save space, wind it tightly around a mini-flashlight (always handy to have on trips) or around a marker. When our family travels we like to bring a few carabiners along. Since we use reusable water bottles to save money and the environment, we opt for bottles that have a handle on the top and use the carabiner to hook them onto our backpack or day bag to save pocket space. My daughter also likes to use one to keep all of her ponytail holders and various headbands hooked together so they are easy to find in her toiletry kit. I’m happy for anything that makes our luggage more organized and gives me less to carry! My family travels with an assortment of zip-style baggies. We use the larger ones for wet swimsuits and to transport bottles of shampoos, body wash, and other liquids so they don’t spill in suitcases. Medium-sized sealable bags are GREAT for protecting cell phones when poolside or on the beach. Your phone will be dry and free from sand, and you can use the cell phone keys thru the bag! Small plastic bags can be used for snacks. Snacks are more economical when purchased in a large bag or box and then you can separate into smaller baggies for easy handling with children. As a bonus, sealable plastic bags can be used to bring home treasure, like seashells or unusual rocks. Unfortunately, I have personal experience with the devastating effects of carbon monoxide. We always travel with our portable combination smoke and carbon monoxide detector. It doesn’t cost a huge amount and is so small and easy to pack that we don’t even think about it, it stays in our suitcase ready for the next trip. 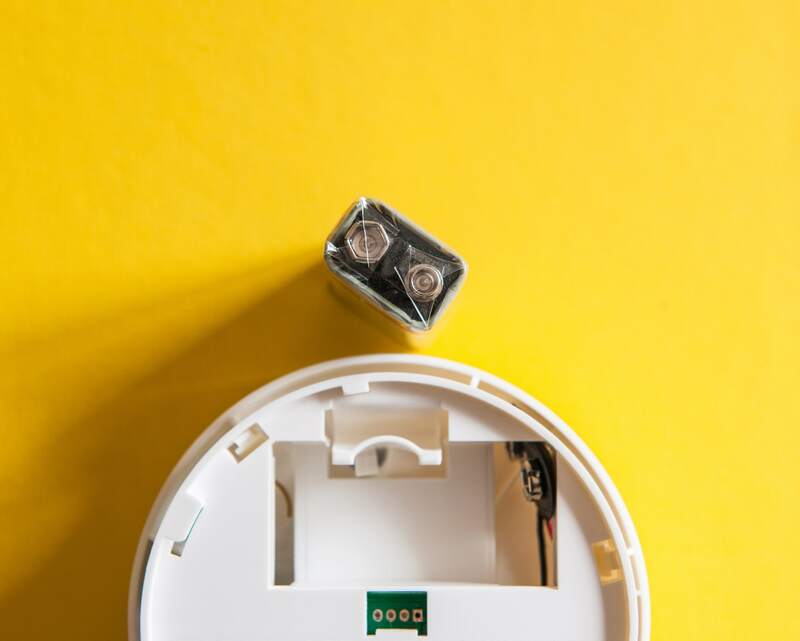 You just can’t guarantee the situation in accommodation around the world and with so many of us using rental home options, it’s even more vital to keep your family safe. I urge everyone to pack one. Nothing kills the fun of a trip like getting sick from the plane. And no one is better at picking up germs than little hands that want to touch EVERYTHING. That is why I always pack antibacterial wipes in my hand bag and furiously de-germ seats, seatbelts, tray tables, windows…anything my kid has a chance of touching. Do I look like an over zealous germaphobe? Yes. Do we waste days of our trip feeling crumby? Not a chance. We have a daughter, and for those of you who are in the same shoes as we, you’ll understand when we say that it takes a little more effort for girls to go to the bathroom than boys. We’re strictly talking about #1, here. For example, in Southeast Asian market restaurants where a hole in the ground is what they call a toilet, squatting is not an option for Western kids. Thanks to Freshette (female urinary director), our daughter was able to remain to stand, just as boys do, to relieve herself without feeling as if she has been contaminated. It’s easy to use, and easy to carry around. It’s a small mechanism that fits easily in a small pocketbook. Works great on planes, trains, and the occasional pulling over in an automobile. Few creations, mediate the biological divide such as this product. Highly recommended! Nobody was happier than I was once my kids were out of diapers, but the one thing I continue to keep in my purse and always, always pack is a package of diaper wipes. Diaper wipes clean faces, hands, gross surfaces you or your loved ones need to touch, and they are excellent for spot removal from clothes as well. Lately I’ve graduated to flushable toddler wipes; not because I want to relive potty training (!) but for taking care of business in less-than-ideal public washroom situations that often have less-than-ideal facilities for personal hygiene as well. We carry reusable water bottles (and a UV filter, if needed). Our kids are always thirsty and it’s nice to avoid one-time use plastic bottles whenever possible for both environmental and financial reasons. I like the collapsible Platypus bottles that snug into our luggage when not needed. I always pack three to four packages of instant oatmeal. The earliest riser can make a breakfast snack before the family is ready to get up. In fact, during one of my mother-daughter vacations in the Bahamas, my daughter (only 4 at the time) got food poisoning and couldn’t leave the hotel room for 36 hours straight. There was no room service at our hotel, so those oatmeal packets served as a much needed breakfast, lunch, and dinner for me. 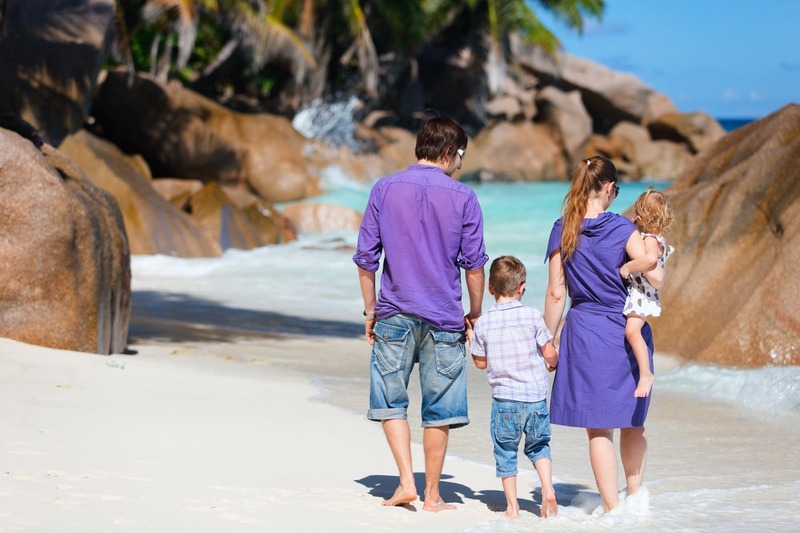 For more ideas, check out these tips for eating healthfully when traveling with kids. We collect air sickness bags from every airplane on which we fly for our three kids who suffer from motion sickness. We stow them in our carry-ons for taxi rides or for super hot airports with long immigrations lines. Also, we put them in the seat pocket of our car for road trips and always have one spare in their backpacks. This way we are always prepared for that unexpected funny tummy. Read about additional products that help with motion sickness for kids and adults. Road tripping with teenagers can be a stinky endeavor. One thing that we’ve found really helpful is to use fragrance-free dryer sheets with a few drops of essential oils on them instead of air fresheners. We attach them to the vents so that the fragrance circulates throughout the car. Not only does this mask all those odors that are present on long road trips, but certain essential oils are great for common road-trip ailments. We use citrus for energy (or to keep the driver from getting sleepy), lavender for headaches, and ginger or peppermint for motion sickness. When we road trip in the winter, we always carry a metal coffee can full of cat litter. When spread behind a wheel, the cat litter offers extra traction in icy conditions. And the metal coffee can can double as a shovel if you need something to help dig out around your car’s wheel well. 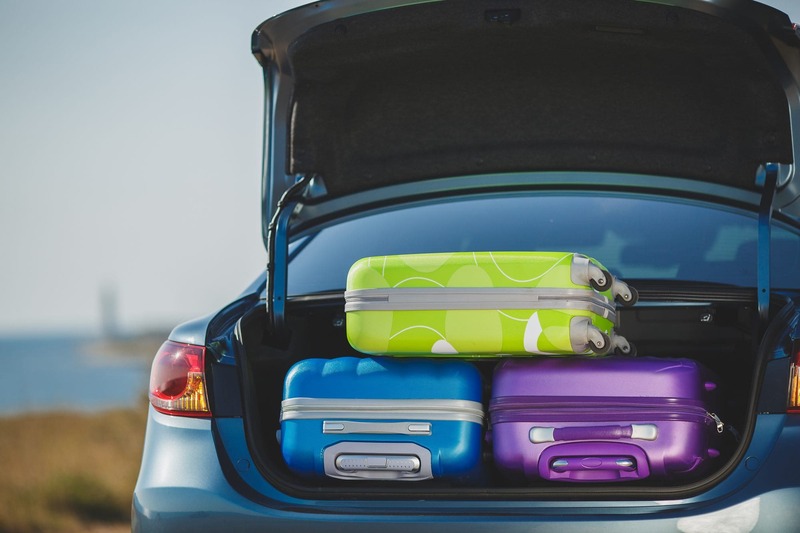 Check out additional items to pack for a road trip with kids. When bathing your youngster in a hotel bathtub, you need a cup for rinsing hair. Often the only cup I can find in hotel rooms, though, is made of glass or porcelain. For safety’s sake, it’s better to pack your own plastic cup. As a bonus, the cup works as a bath toy perfect for filling and pouring. I recommend packing Febreeze…because boys. I like to pack a few of the mini bottles for road trips. They are great for freshening up the car, bathrooms, shoes, and clothing. After giving one too many baths using full-size towels in hotels, I started packing a small washcloth in my children’s toiletry bag. It made bath time for my babies and toddlers much easier while on the road. Even now that my children are old enough to typically shower, it’s still been useful for lathering up and for quick face washes after nighttime ice cream treats. While you’re packing a plastic cup and wash cloth, you might as well bring along some bath toys, too. When my kids were wee, I kept a separate stash of bath toys just for travel. Being reunited with their beloved splashy toys always helped motivate my kids to take a bath while away from home. Stackable cups can double as entertainment on the plane or in a car, too. When we travel, we travel light and our kids have to carry all of their own belongings on their back, sometimes for a kilometer or two. One thing we never forget is a deck of playing cards. These come in handy when we are waiting for food, sitting for hours on a train, or just need something to do in the evening. Be sure to bring along some outdoor toys for use at pit stops and your destination. 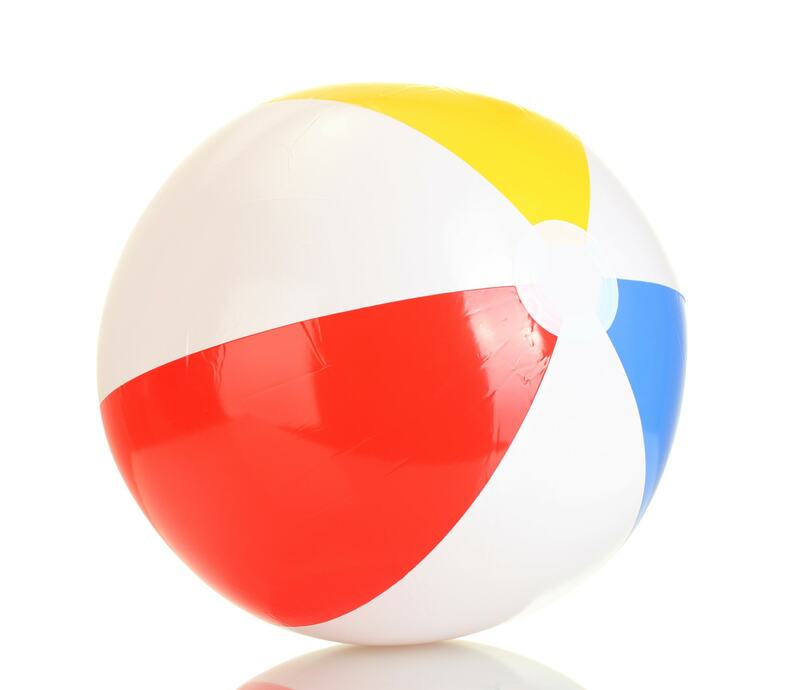 A beach ball, flying disc and bottle of bubbles go a long way in entertaining kids at the beach, park or rental home yard. For additional entertainment ideas, take a look at the best travel toys for kids, from babies to teens. More often than not, I’m stuck in a hotel room with my kids and there is noise coming from somewhere. My oldest might be snoring like a sailor, a couple could be coming back late at night and chatting a bit too loudly, an ambulance is screeching down the street far below, or another family is up way too early in the morning next door. In any case, my serene hotel room is not that quiet place we all thought we were getting when I started planning our family vacation. This is why I always pack a portable sound machine. A sound machine creates a consistent sleep environment for my boys that they are accustomed to at home. It also blocks out extra noises and allows me to stay up late working long after they have gone to bed. 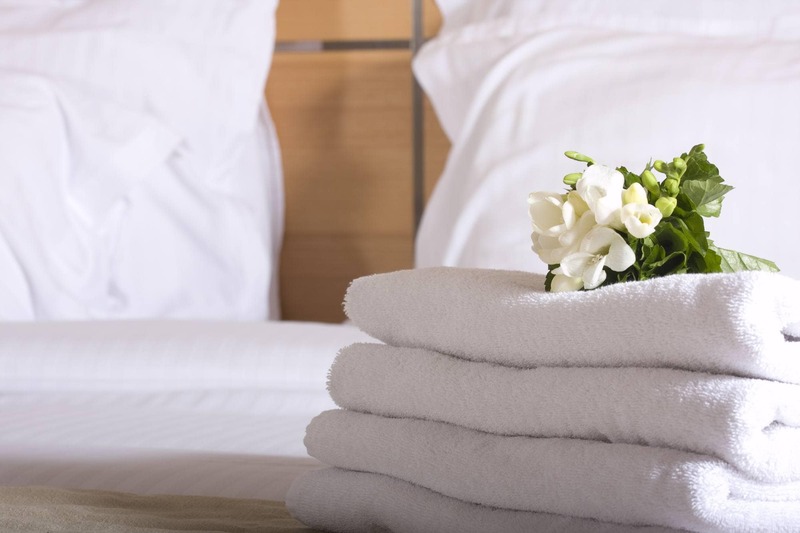 A simple, portable box, or even a white noise app, turns what could be a restless night into that cozy hotel room I need for my family. A clothespin or two packed along in your travel bag can work wonders beyond the clothesline. Use a clothespin to secure and fully close those pesky hotel curtains that never seem to meet and always let that annoying sliver of light through, just as you’re trying to get the kids down. Clothespins are useful for clamping all manner of other objects, especially in cars on long road trips. After a few bad experiences with kids not being able to sleep due to the outside light we started packing a roll of aluminium foil and Scotch tape to cover hotel room windows when necessary. If you are used to traveling in the USA you may never experience this issue as blackout curtains are pretty much standard in most hotels. However, it’s not often the case in many other countries. Aluminum foil has been a real life-saver for us on many occasions when staying in places where the sun rises early and sets late, or in busy cities with street lights and flickering neon lights all night long. Our kids will wake as soon as the sun does, so using the Gro Anywhere Blind from The Gro Company has saved us many early mornings on our travels. The portable blackout blind uses suction cups to attach easily to any window and packs small enough that we can always fit it into our luggage wherever in the world we travel. For more ways to improve your family’s sleep while on vacation, take a look at these travel sleep tips for babies and children. Now you know the unusual things to add to your family vacation packing list. Make sure you don’t forget the rest! Take a look at all of our packing lists. From a packing list for traveling with babies and toddlers, to a pack myself list especially for kids, to what to pack for a romantic getaway and beyond — we’ve got you covered! 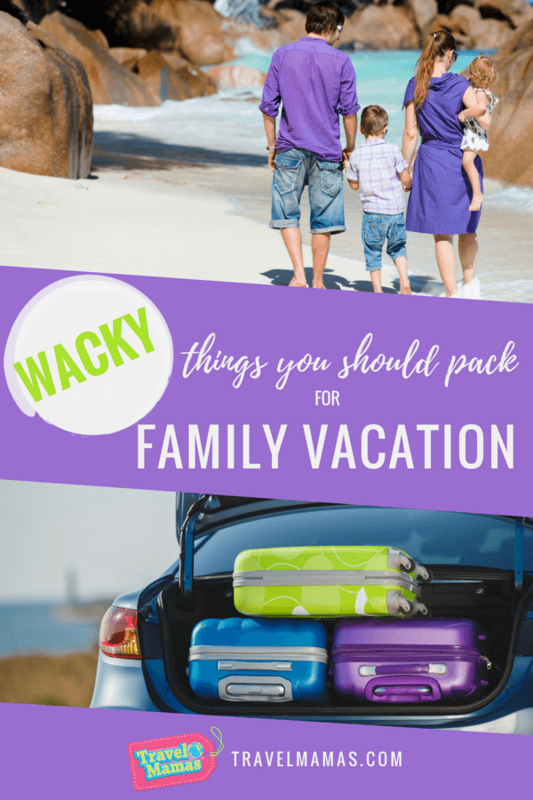 Be sure to save this list of wacky things to pack for family vacation by saving the image above to Pinterest! What unusual item is on your family vacation packing list? Let us know in the comments below. These are really unusual items but are indeed worth adding in your packing list. I learned so many great tips from my fellow family travel bloggers in compiling this list! I agree with the ductape and wipes. We keep Uno in our suitcase for when we travel. My kids love it and it keeps everyone entertained. Uno is such a fun and compact travel game – good choice! You are definitely prepared for any emergency on your trip. I never thought of CO monitor but it does make a lot of sense to be safe. I’m actually bringing two C02 detectors with me to Mexico for our monthlong stay. We are renting a large 2 story house, so I’ll put one on each floor. Wow you thought of EVERYTHING! I am famous for remembering to pack barely everything, drives my husband nuts! Love learning tips from my fellow family travel bloggers! Wow this is really is a lot of everything you could ever need. It’s great though all your safety tips here I’ll be using these! So glad, Kristin. Happy travels! These are some amazing items to take on road trips. I love the air freshener idea. Right?! I never would have thought to create an air freshener from a dryer sheet + essential oils! So much healthier than using chemical scents! So many awesome suggestions! As a family that makes it a point to travel as much as possible, I can not wait to incorporate some of these helpful hacks. Agreed! So many great hacks here – I’m adding some of these to our packing list for our monthlong trip to Mexico. We leave tomorrow! I love the idea of packing instant oatmeal. When we vacation, we usually stay in a villa with a full kitchen, but I don’t always want to cook. This oatmeal would be perfect for in-between takeout meals. We usually bring peanut butter and bread but instant oatmeal would be so much easier & more compact to pack! This was a great read. I’d never think to bring any of these with us on a family vacation but a lot of them made me go, oh wow yes! So this was really helpful! Right?! I was surprised by so many of these but definitely will pack them for future trips! So many good ideas. The carabiners are my fave. That’s something that really would be handy! I’d never thought of carabiners before either but they really do make good sense! The carbon monoxide detectors are something I would seriously consider getting. We never know about exposure to it. All the more dangerous if we are sleeping. Thanks for this list you shared. I will seriously consider most of these things next time we go on a trip. I’m packing two carbon monoxide/smoke detectors for our monthlong trip to Mexico. Better safe than sorry! This is a great list! It’s always great to be ready especially when you’re going on a vacation with kids. You can never be too prepared if you ask me! So many great ideas. One tip for toddlers and the beach ball… if on a road trip, stop at a tennis court and let them have fun. Enclosed and a great place to burn off the energy. Head lamps are a must, so many great uses. Good tip! Thanks for sharing, Kristi! I would never think to pack some of these things but i love it! I always pack instant oatmeal when we travel to save money on breakfasts. 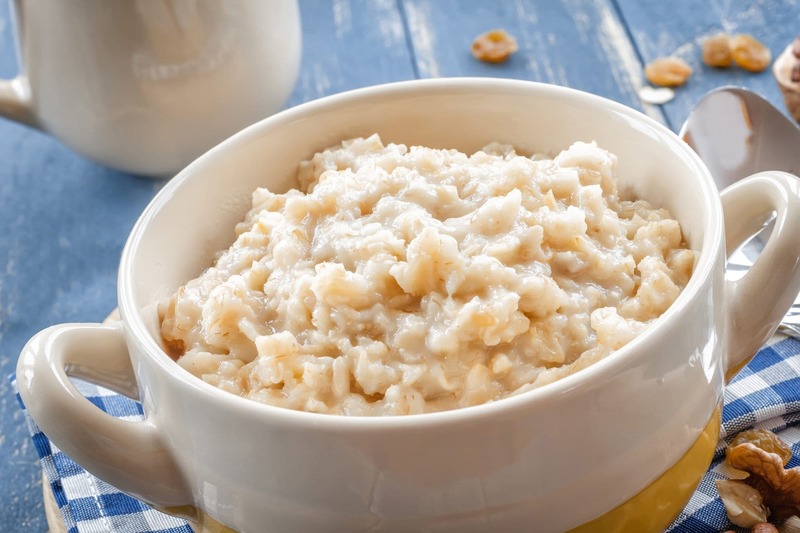 I can’t believe I never thought of packing oatmeal before compiling this list. Definitely need to add this to our packing list! You have a really great list of travel items that I would of never thought to pack. I don’t have a family but I travel A LOT so this list will definitely have things I want to remember to pack! Kiwi – Thanks for your comment. You’re so right that many of these items work well for travel, whether bringing kids or not! That’s a pretty comprehensive packing list that will definitely help families have a better travel experience! It’s nice to make sure that the whole family has a great trip! I must admit that I’m an over-packer, but I like my family to be as safe and as comfortable as possible when we travel!